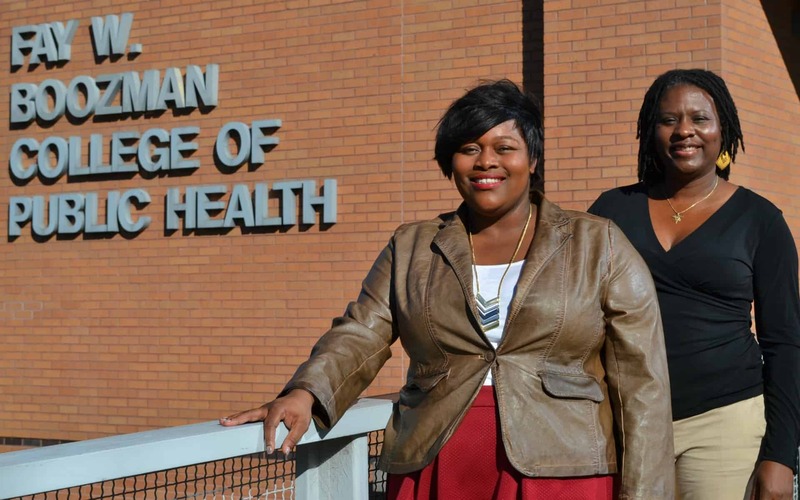 Tiffany Haynes, Ph.D., left, and Keneshia Bryant-Moore, Ph.D., R.N., have secured a contract to create a collaborative network between UAMS and the faith community in Arkansas. Dec. 1, 2016 | Dec. 1, 2016 | Two College of Public Health faculty members have secured a $250,000 two-year contract to create a collaborative network between the faith community and University of Arkansas for Medical Sciences (UAMS) for the advancement of diversity in research. Keneshia Bryant-Moore, Ph.D., R.N., associate professor; and Tiffany Haynes, Ph.D., assistant professor, received the funding from the Patient-Centered Outcomes Research Institute (PCORI). The Arkansas Faith-Academic Initiatives for Transforming Health (FAITH) Network will be a collaboration between UAMS and faith organizations in Arkansas to provide an infrastructure that supports ongoing engagement, training and networking opportunities. Similar networks have been developed, but do not target the whole state or engage a diverse sampling of the faith community, Haynes said. PCORI is an independent, nonprofit organization authorized by Congress in 2010. Its mission is to fund research that will provide patients, their caregivers and clinicians with the evidence-based information needed to make better-informed health care decisions.